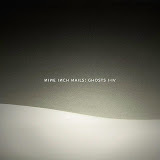 Ghosts I - IV is available in several formats from a free mp3 download version to the $300 limited edition package which includes: the download in mp3, flac, or apple lossless format for immediate access, 2 audio CDs, 1 data DVD with all 36 tracks in multi-track format, a Blu-ray disc with Ghosts I-IV in high-definition 96/24 stereo and accompanying slideshow, along with an exclusive four-LP 180 gram vinyl set in a fabric slipcase, and two exclusive limited edition Giclee prints in a luxurious package. Limited to 2500 pieces, numbered and signed by Trent Reznor. Update: Since nin.com is having problems keeping up with the load at the moment, you can get a 256kbps AAC version of Ghosts I-IV via BitTorrent or directly here. Enjoy it now, buy it later! In the meantime, you can buy the whole new record at Amazon if you are in the U.S., or you can get Ghosts I at The Pirate Bay if you know about torrents, or or RIGHT HERE directly.